History is spiked with aspirational moments that influence a turn, a new narrative, a change of course. It's easy to look back and marvel at past historical moments. The signing of the Paris Agreement in December 2015 was a “watershed moment," for international unity and also for business, says Cynthia Cummins, Director of Private Sector Climate Mitigation for World Resources Institute, in a recent interview with TriplePundit. WRI is a principal partner in the Science-Based Targets Initiative, a collaborative effort between the Carbon Disclosure Project (CDP), the World Wide Fund for Nature (WWF), and the United Nations Global Compact (UNGC). Framing any current event in a larger historical perception is fraught with our own bias of temporal perception. It's a challenge to see the big picture from within it. We can portend and influence, but never know the future. In real-time, historic moments seem to take forever. Two years after it was first signed, and a year after it truly came into force, the Paris Agreement is alive and well. Increasingly, it is a rallying point for businesses looking for a signpost toward action. Couching a marketing message in greenwash is nothing new in business. But it's a harder sell than it used to be. “When the Paris Agreement was signed,” Cummins says, “it gave companies the certainty they needed. “They see that the whole world's harmonizing around the same level of ambition and helps them understand that they need to take action to have a license to operate." Satisfying consumer demand may drive initial steps toward sustainability, but existential risk brings to business a "come to Jesus" moment. Climate risk impacts markets, production costs, resource availability and shareholder value. 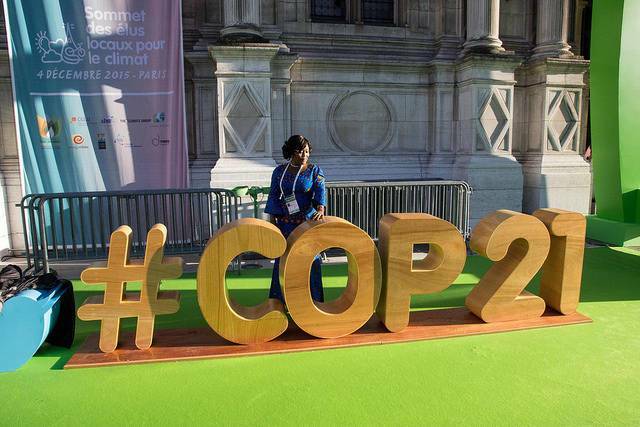 The principal criticism of COP21's outcome is its focus on aspiration over ambition and binding targets. A point taken, but such criticisms miss a larger point: what it took to get this far and the opportunities the Paris Agreement represents for real change. The lasting “magic” of COP21 rests in the Nationally Determined Contributions (NDCs), the defining mechanism for a shared effort toward a common goal. The NDCs give contextual flexibility for each nation to choose their own path for emissions reduction. This flexibility brings more influential voices into the conversation. Global warming cannot be managed without global commitment. Coming on the heels of UN adoption of the Sustainable Development Goals, the Paris Agreement reinforced an “un-siloing of sectors,” opening the playing field to all stakeholders. But it remains unclear who is in it to win. Or what winning even looked like. While a significant historical turning point, the Paris Agreement is, of course, a compromise. Nationally Determined Targets define what each country considers "feasible." Friction tends to sneak into agreeing on what is feasible. This non-binding detachment from science-based targets is why “increased ambition” is critical to the success of the Paris Agreement and remains central to the discussion at the conclusion of COP23. "There's been a real void out there," says Cummins. "Governments have not been communicating with companies what climate leadership looks like and what level of ambition they need to take." "Science-based targets has helped to fill that void," she says. The Science-based Targets Initiative "sends a clear message to the private sector" about the required level of ambition and what climate leadership actually looks like "in our current environment," Cummins says. Where governments may be mired in indecision and half-measures, science-based targets provide a platform for corporate climate leadership, from defining what a science-based target is to designing and implementing an audited mitigation target. There are many thousands of articles on how to increase business efficiency. Arguably, no business is able to fully maximize every possible aspect of efficiency. How it chooses to focus resources toward efficiency expresses its values. The transformation of “corporate social responsibility” from a niche marketing-focused sideshow to a critically-assessed core operating value is clearly underway, emphasizing the increasing business value of the triple bottom line. More than 300 businesses are taking action through the initiative, 84 of those already have set approved targets. And the trend is up. Cummins says that "about 2 companies per week" join the initiative. "There's a lot of work to do."